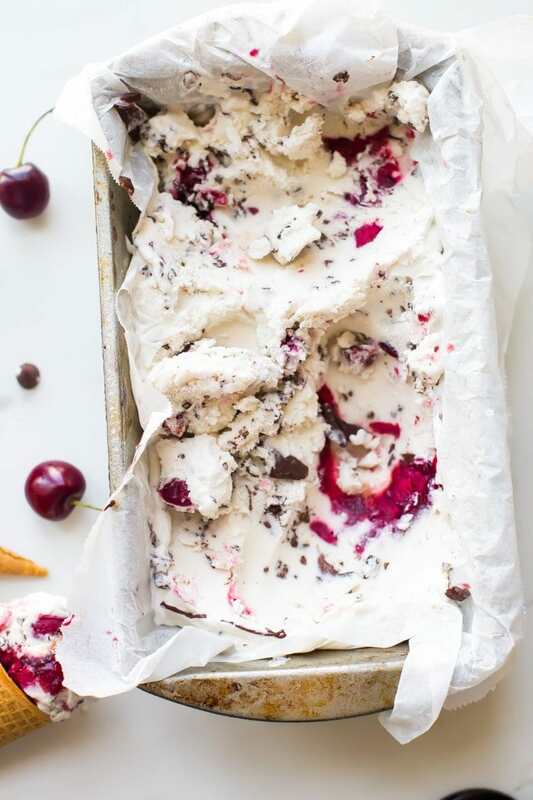 This paleo chocolate chip ice cream with roasted cherries is easy, rich, a bit tart, and totally delicious. 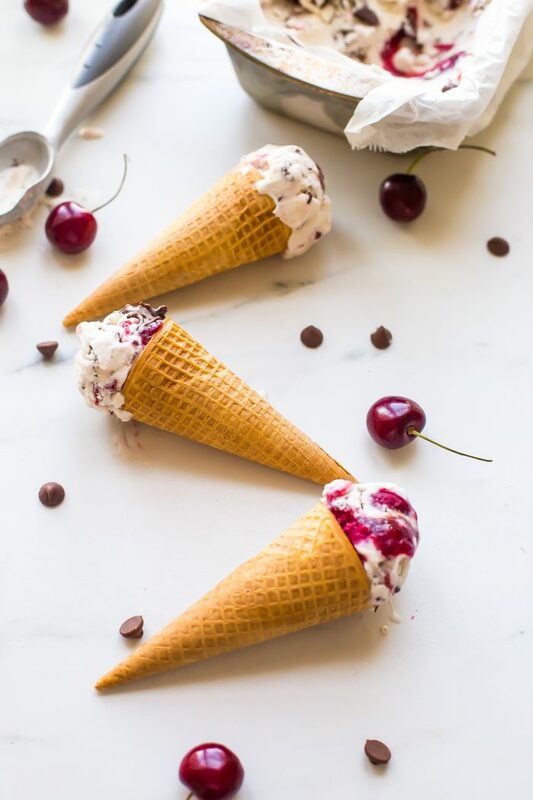 With a vegan chocolate chip ice cream base, inspired by Italian stracciatella, it layers heady, roasted cherries, producing the perfect creamy, tart, chocolatey combination. Such a fantastic paleo ice cream recipe (or vegan ice cream recipe, if you prefer!). 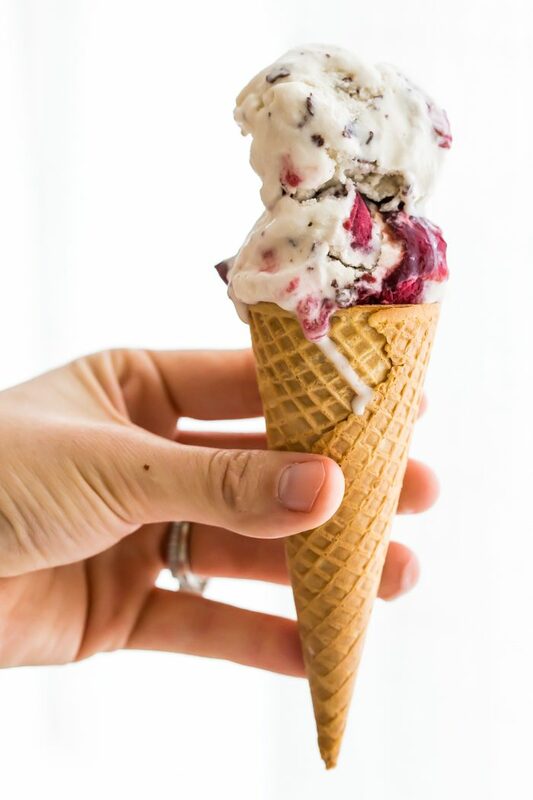 You absolutely must try this paleo chocolate chip ice cream with roasted cherries while the fruit is still in season. There’s this vision I have of Italy, a collective memory collaged together from the time I’ve spent there: on that honeymoon a few years back with my brand new husband. Or the time I came home from college one summer, not yet even 21, and jetted across the Atlantic with my family into that tiny Roman airport. The vision, the representation of the country in one flash of an image? Tubs of gelato, domed up and out of their containers, sprinkled liberally with the ingredients used to make that particular variety in various states of wholeness. A not-so-subtle visual menu to feast upon, used to inspire your selection, invariably ending up two scoops high, posted on Instagram and inducing jealousy of even your most secure friends. Of course, I don’t get to Italy as often as I’d like (does anyone? 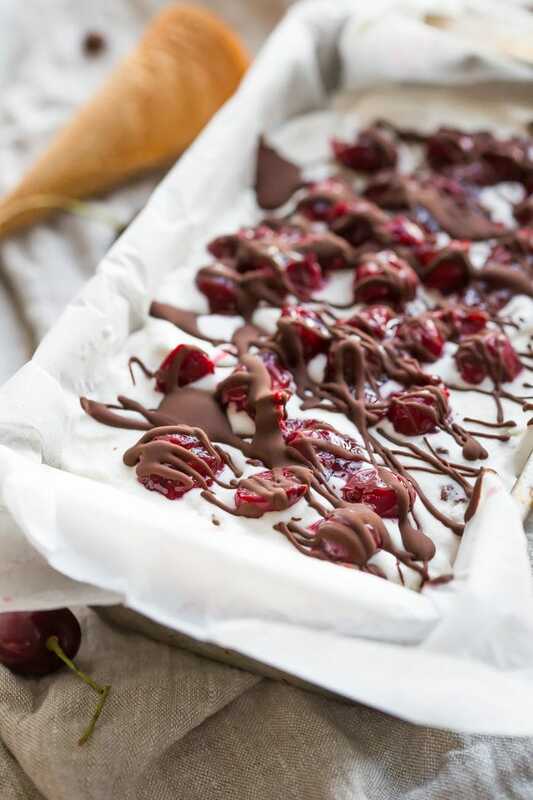 ), so I decided to divine a bit of Italian spirit this summer by marrying a super rich paleo ice cream, slightly tart, subtly sweet roasted cherries, and a melted chocolate drizzle, creating the tiniest little chocolate chips. I, of course, topped the entire thing with more of the same, turning my kitchen into a poor but manageable excuse for a gelatería. 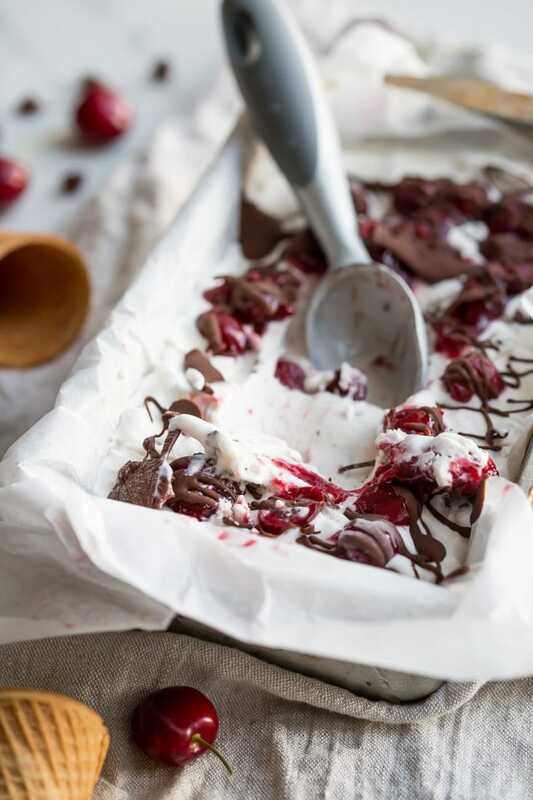 When I look at this pan, full of paleo chocolate chip ice cream with roasted cherries, it reminds me of those little shops, the one by the Trevi Fountain with all the postcards and tourists threatening to remake La Dolce Vita. The one by the little piazza in Florence where O and I stumbled upon a Charlie Chaplin-inspired street performer. I stood there with my two scoops, laughing at the tiny volunteers he pulled from the audience circled around him, moved by the moment and sounds and tastes and my God we’re married and we’re in Italy. Gelato? It’s a spiritual experience for me, and consequently? I’m picky as hell about my frozen treats. And while I’m a sucker for gelato, it’s Jeni’s that’s my icy soulmate, and specifically their goat cheese roasted cherry ice cream. Jeni’s is something, like gelato, that I have to get when I come within a 25 mile radius of the stuff. The nearest to us is in East Nashville, and we’ve developed a routine around it: ramen at Two Ten Jack followed by a short toddle a few doors down to Jeni’s. We’d wait in line long enough to prompt 2, almost a third but not quite, complaints from O, begging me to pick another place. We’d watch the hipsters queued in front of us tasting every damn flavor, saying nothing, anticipating our own offense. And when we finally reached the case? It becomes impossible to reject a flavor, to say no to a genius creation and pairing of flavors I’d never, ever think to drop into my ice cream. Goat cheese roasted cherry in a waffle bowl with honey butterscotch caramel and freshly whipped cream. Every damn time. But I can’t survive without it when we’re in not-Nashville. Instead, I settled for pricy pints of the stuff sold at the gourmet grocery down the street. But then, of course, came the Great Jeni’s Listeria Crisis. I was pretty damn pregnant, with only two months to go until Leo’s debut, and I’d just receive the worst news ever. So I waddled my bloated self back to The Fresh Market and got my refund, using my $13.11 to buy enough ingredients to make a few pints of the stuff, and got to work. 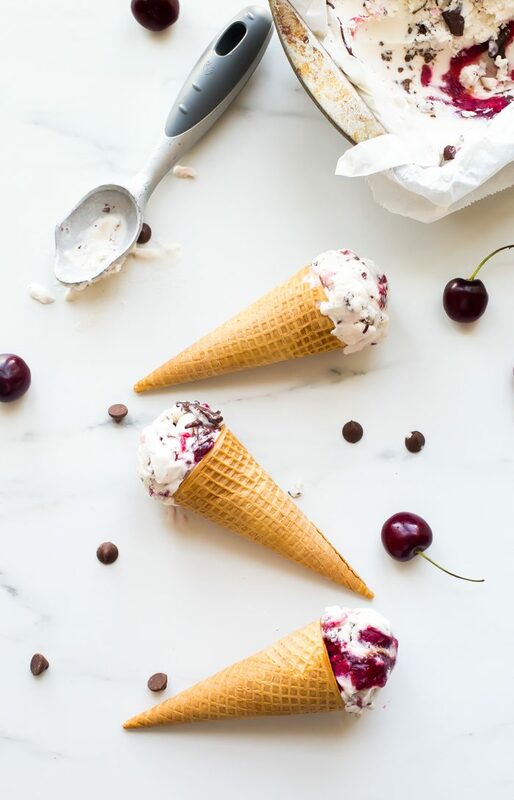 What came out of my ice cream maker was quite possibly even more divine: rich and creamy without too much air, just like my beloved gelato, with a bit of tang from the goat cheese, and a deep fruitiness from the roasted cherries. In fact, I posted the recipe almost two years ago to the day! 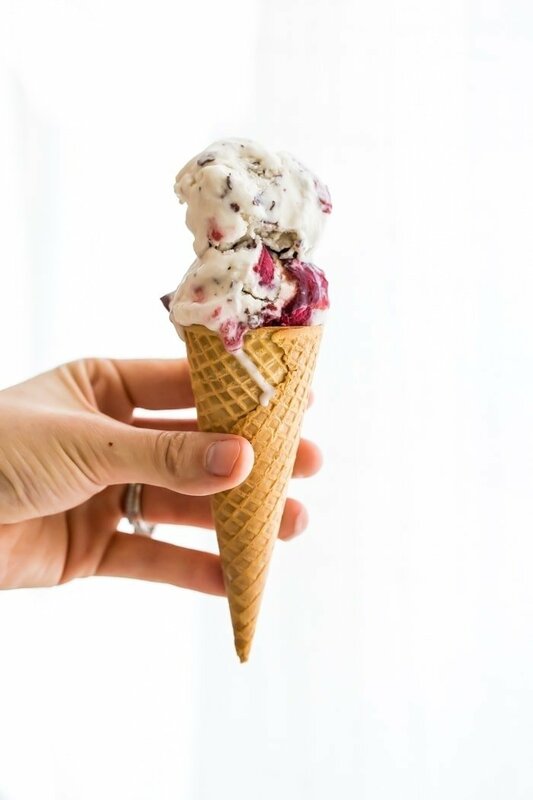 This paleo chocolate chip ice cream with roasted cherries is inspired by my all-time favorite from Jeni’s but is made with no dairy and no refined sugar. It begins with a simple but creamy coconut milk base, made entirely in the blender then frozen in the ice cream maker. In the last minute of churning, you drizzle in a chocolate-chip-coconut-oil mixture, watching as the stream freezes on impact, producing the tiniest little chocolate chips that scatter throughout the entire mixture. 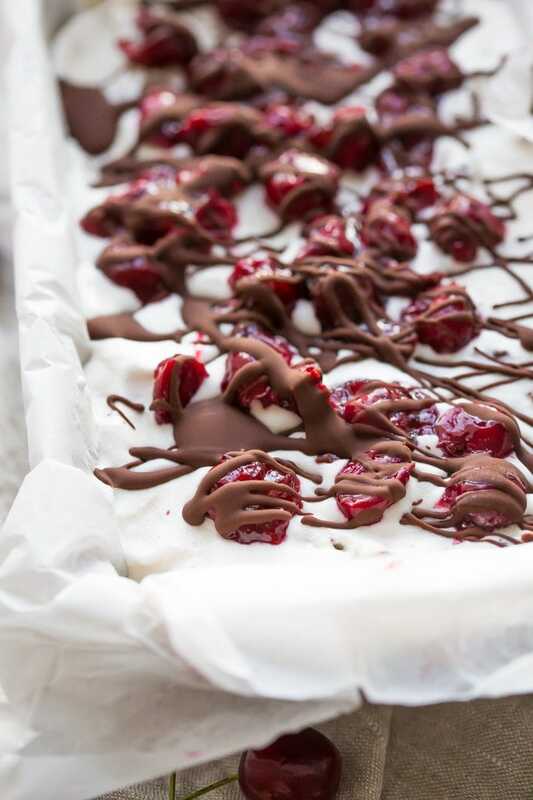 You layer the paleo stracciatella with roasted cherries, thickened by a bit of arrowroot, and top everything with more cherries, more chocolate. So rich, so decadent, and a bit fun-loving: totally worthy of Italy. Preheat the oven to 400°F. Combine the cherries, 1/4-1/3 cup maple syrup, and arrowroot in a 9-inch square baking dish, tossing to mix. Roast for 30 to 40 minutes, until the juices are thickened and bubbly, stirring every 15 minutes. Let cool completely. Combine coconut cream, 1/2 cup maple syrup, and vanilla extract in a blender and process until smooth and frothy, about 3 minutes. Pour into fully frozen ice cream maker bowl and churn according to manufacturer directions. Meanwhile, melt chocolate chips and coconut oil together in a small bowl. Microwave 1 minute then stir very well. Continue microwaving in 30-second bursts, stirring very well in between each burst; it won't take very long. Let cool. After ice cream maker has run about 35 minutes and ice cream mixture is about the texture of soft serve, slowly drizzle all about 2 tablespoons of chocolate mixture into ice cream maker whilst churning. Turn off ice cream maker and scoop half into loaf pan. Spread half of the cooled roasted cherries on top of ice cream, then scoop remaining half of ice cream on top of cherries. Finish with remaining cherries. Drizzle surface with remaining chocolate mixture. Freeze 1-4 hours before serving to allow to harden as desired. But-oops-it’s all in the freezer now, so I’ll have to wait and see. I blended for about 4-5 minutes, but don’t have a special high-speed blender. From what I ‘sampled’ while cleaning up, it certainly tastes delicious so far. Do you think an electric beater might work better for my next time making this? You didn’t mention when to add the lemon juice, so I added it in the blender with the coconut cream, Etc. My mixture is not really smooth and frothy, but rather separated and clumpy. I’m going to wait until it’s all frozen but so far this is not looking right. Did I do something wrong? If your coconut cream mixture is a bit clumpy, you probably need to blend it further. Do you have a high-speed blender? If you blend it long enough, it should definitely become very, very smooth. You’ll definitely want to get to this consistency before putting in the ice cream maker and freezing. Can you try that? The lemon juice shouldn’t affect anything.